I processed my membership payment through the BPS site, but on PayPal I see an item labelled something similar to “Trial Period” with low monetary value? Example of how a recurring PayPal payment to the Society is broken down in PayPal. When you go into PayPal, you may see a breakdown of costs similar to the image to the right. 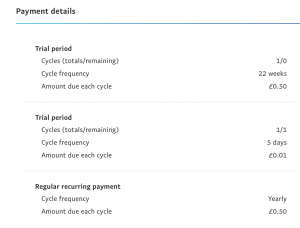 These “Trial Period” messages in PayPal are a well documented workaround used by the subscription package (WooCommerce Subscriptions) that powers the Society’s membership renewal process. You can view the error message by following the link here, and navigating to the FAQ item “Why does PayPal Standard split the subscription…”. Whilst this is nothing to worry about, we fully acknowledge that this can be a confusing thing to see on your PayPal statement. Please rest assured that the society will only take the funds required to process your membership (i.e. the amount on the membership tier that you sign up for) on an annual basis with all payments synchronised to 1st January. If for any reason the system takes any additional payment, we will ensure that this is refunded in a timely manner. If you have any concerns at all, please do contact the Webmaster at admin@brphycsoc.org.